Again there are a bunch of new features in Bitrix24 to tell you about – and not only in Bitrix24, but also in the Bitrix24.Network. Many users work with different Bitrix24 intranets – in some as an administrator, in others as an extranet user, and in others as an employee, using different logins for each. But remembering emails and passwords for each Bitrix24 intranet is not easy, even if you have a good memory or you save your login information in a special program. In any case, this is an unwanted complication, requiring extra time and effort when shifting from one intranet to another. But now it is possible to unify all your login credentials into one, so you need to remember only a single email login and password combination. 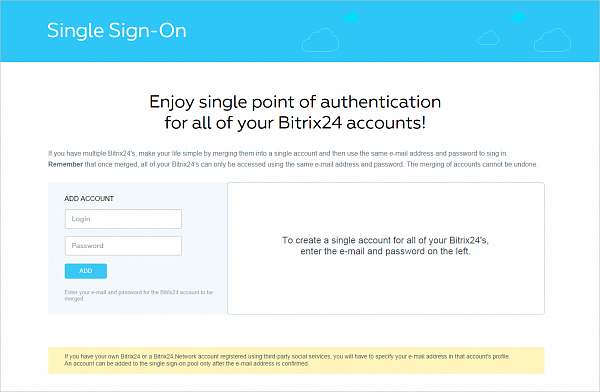 After this, you will be able to enter any Bitrix24 intranet where you have set up this single sign-on. If you already use multiple Bitrix24 intranets but you use the same email and password in all of them, then you don’t have to do anything. The system automatically unites the list of all your Bitrix24 user profiles into a single account in the Bitrix24.Network and that means that you can authorize into the Network and you will see a list of all Bitrix24 intranets to which you have access. If you work with multiple Bitrix24 intranets using different emails and passwords, then you have probably have noticed that you cannot be logged into more than one of your Bitrix24 intranets from a single browser at the same time. Of course, this is inconvenient – you have to remember all of your different email and password combinations and either log in using a second browser, or constantly log in and out of your various intranets. Now you can create a unified authorization for all you Bitrix24 intranets and use a single email and password combination. To make this as simple as possible, your Bitrix24.Network account has a new point in the list of intranets under the button “My Bitrix24” that is called Single sign-on. Click on that link and you will come to a page wh ere you can collect all of your Bitrix24 intranets into a single, unified account. First you need to enter the email and password of each account which you want to unify. After checking the login data, the system will provide a list of all Bitrix24 intranets to which the entered account has access. You can then enter data from a second Bitrix24 account – that is, enter one of your other email addresses and its corresponding password. In the second column, you will see a list of Bitrix24 intranets to which this account has access. 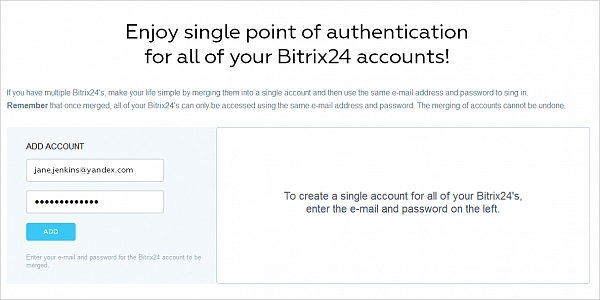 You can thus unite all of your Bitrix24 accounts and their corresponding Bitrix24 intranets. In the next step you will choose with email and password which will be the main one, under which the others are unified and through which they will be accessible. This is an important step – note that the process of unifying accounts is irreversible. If you choose the main email and click on the Make primary button, the system will automatically create a united login for all of the Bitrix24 intranets that appear in the list. After this you can enter any of these intranets using (and only using) the primaty email and its corresponding login. Logging in via the other email and password will NOT be possible. How can I unite login for intranet into which I log in using a social network? 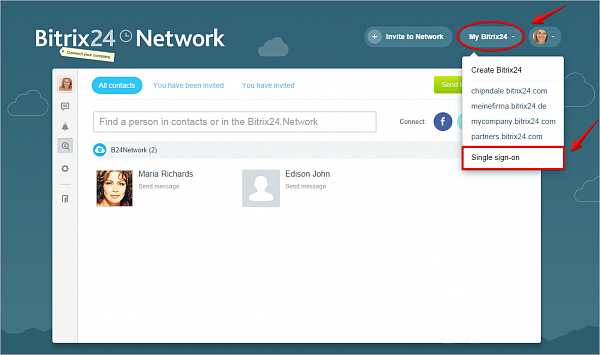 If you register a Bitrix24 intranet via a social network, your login data is not tied to a specific email address. To be able to merge this account with another one, you need to specify an email address for it. To do that, go to the profile editing page via the Edit my Bitrix24.Passport link. Note that to complete this connection, you must confirm the email address which you have entered by clicking on a link send in a message to that email address. What happens after these accounts are united? After you have chosen a main email and password, all your Bitrix24 intranets and messages will be collected into a single Network account, in one Bitrix24.Passport. The data in your Bitrix24.Network profile will be taken from the account which you selected as the main account, so we recommend that you verify that your colleagues and contacts will be able to recognize you from the data provided. Conversations will also be united, if you have been in a dialog with someone through someone via 2 different Bitrix24.Network accounts, these conversations will be saved in the new united account, one as a regular chat, the other as a group chat, with the history and perform search as per the regular functionality. In this way, you can create a united entry point for all of your Bitrix24 intranets with a single email and password combination. P.S. On our site, there is also a page that provides a description of Bitrix24.Passport and the united password system.